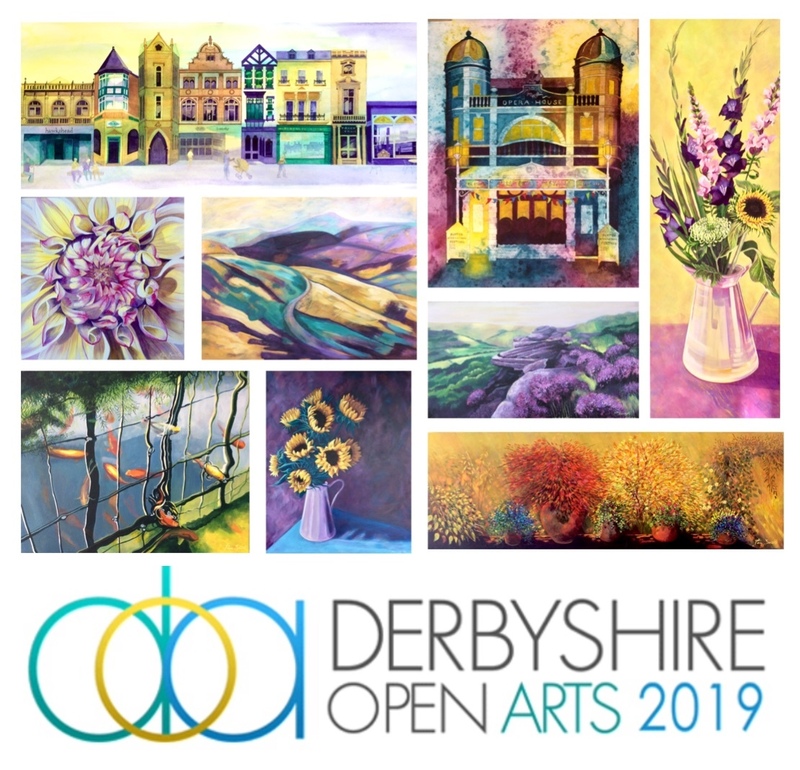 My studio will be open to the public for Derbyshire Open Arts weekend and I will be joined by local watercolourist Carole Knight. We will be demonstrating our painting techniques throughout the weekend and there will be originals, cards, prints and merchandise on sale. We hope you can come and join us for tea and cake in the garden - all proceeds will go to local charity Blythe House Hospice. 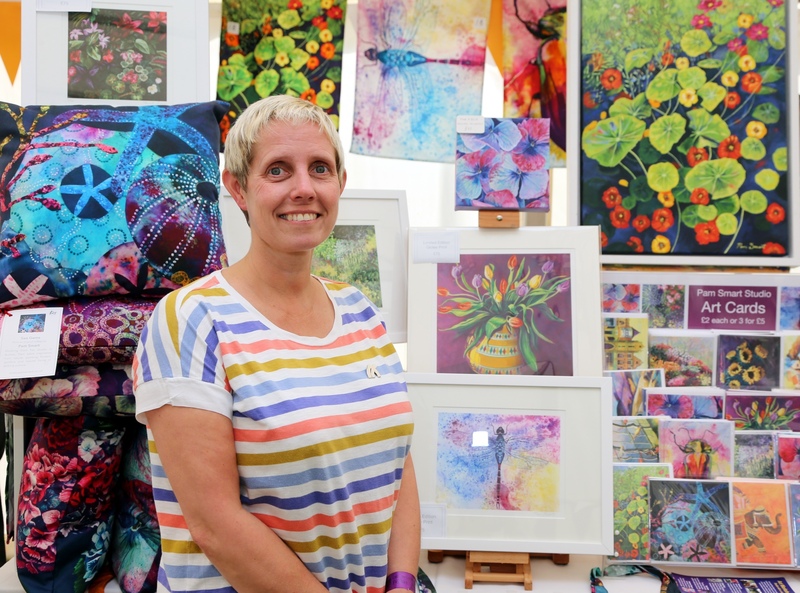 “I am very proud to be exhibiting at Chatsworth for the first time with Peak District Artisans”. Pam will have four paintings on display there. Pam is really excited to be showing six brand new paintings at the Jarva Gallery Christmas Exhibition! 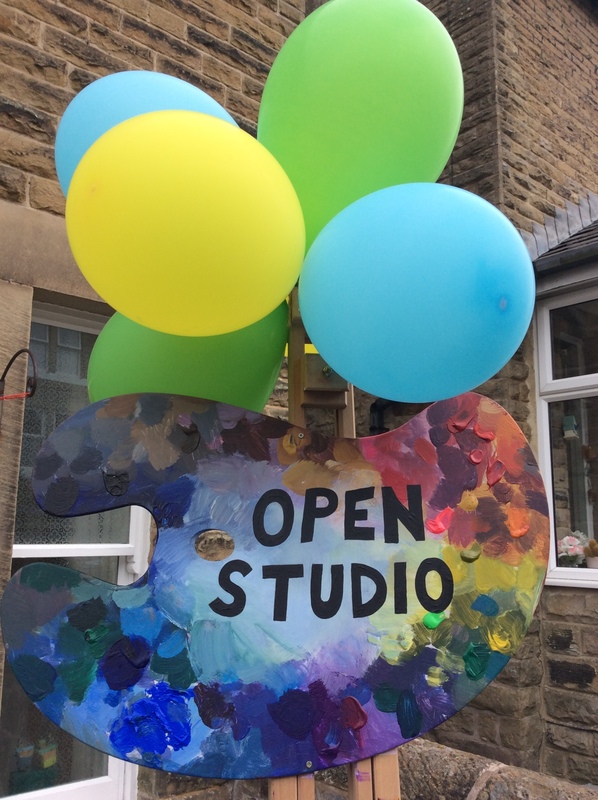 Lyndsey Selley at Jarva in Whaley Bridge has invited 10 artists to be involved. 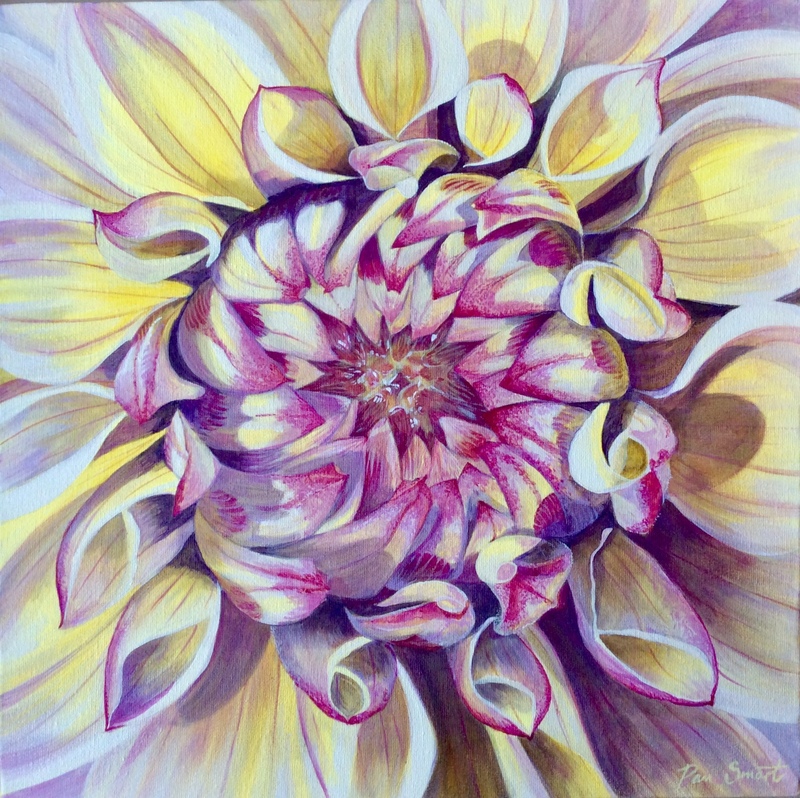 You can see a sneak preview here of one of Pam’s latest paintings which will be featured. The Whitworth at Darley Dale is a beautiful gothic building and will be hosting the Peak District Artisans Winter Art Fair. 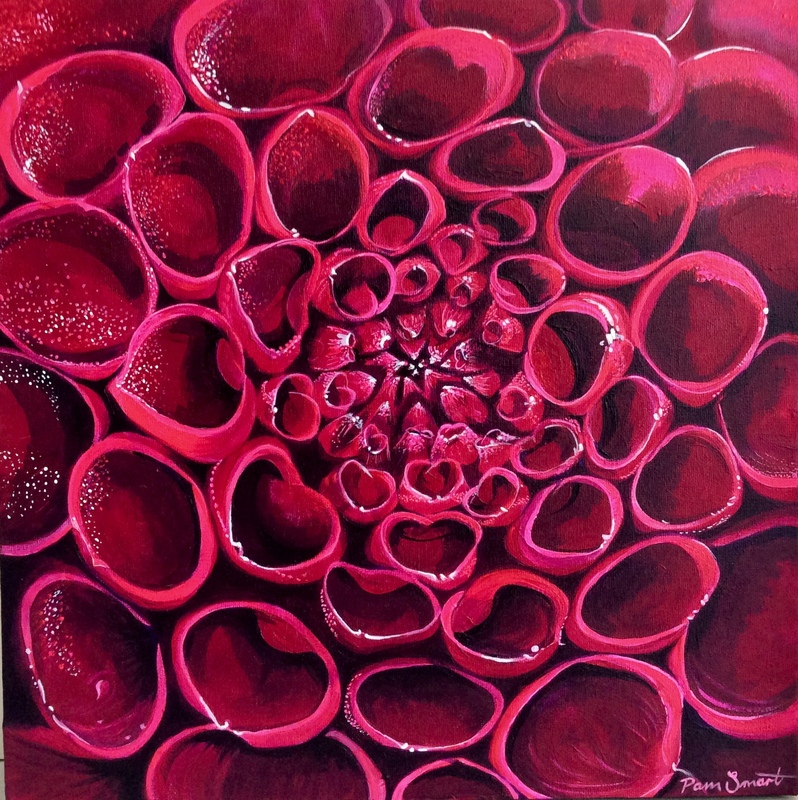 Pam will be exhibiting alongside 25 artists selling a diverse range of original artworks and unique artisan products. A great opportunity for some early Xmas shopping! 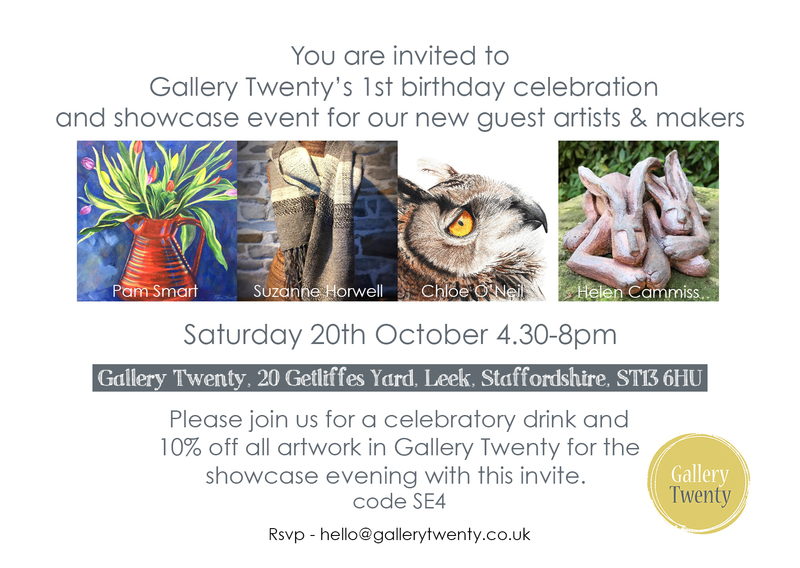 Pam is delighted to join Gallery Twenty in Leek as one of four guest artists. She will be showing a range of her work from October right up until Xmas Eve. 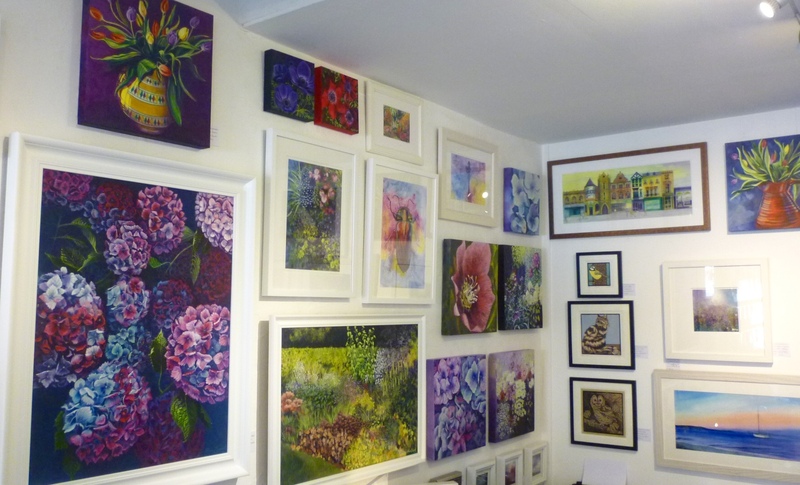 It is a delightful little gallery selling contemporary artworks at affordable prices. 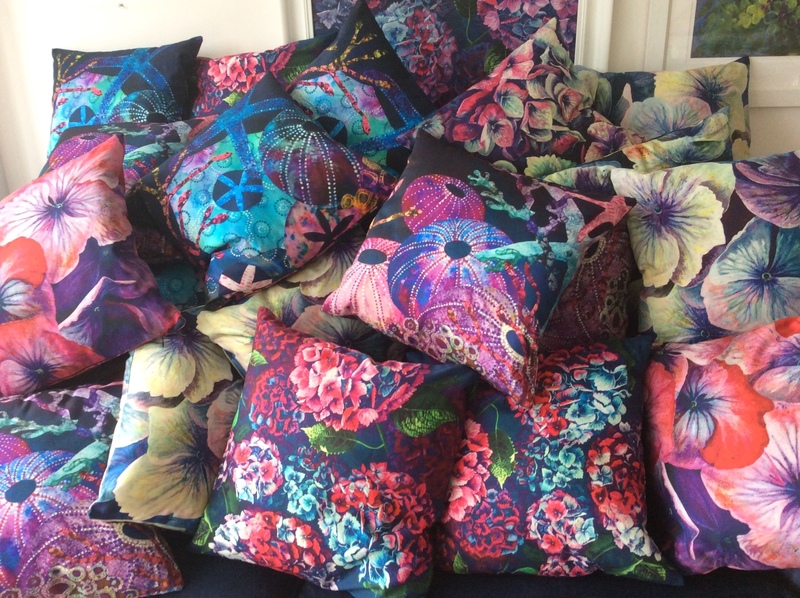 As well as original paintings, cards and prints, some of her fabulous printed textile products will be available. 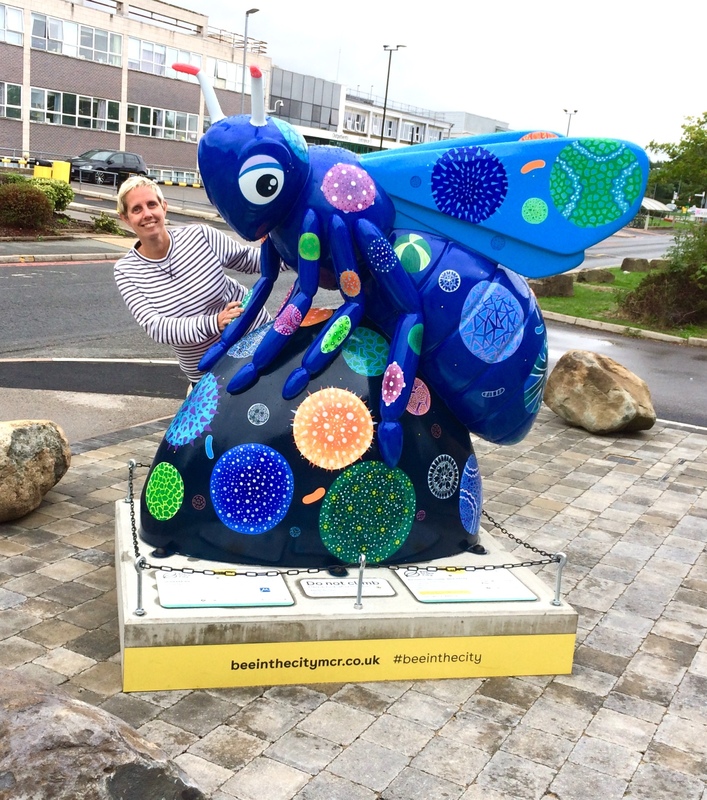 Pam’s design called ‘Sneezebee’ was chosen to be painted onto one of 101 giant bee sculptures which were on display across the city of Manchester throughout the summer. 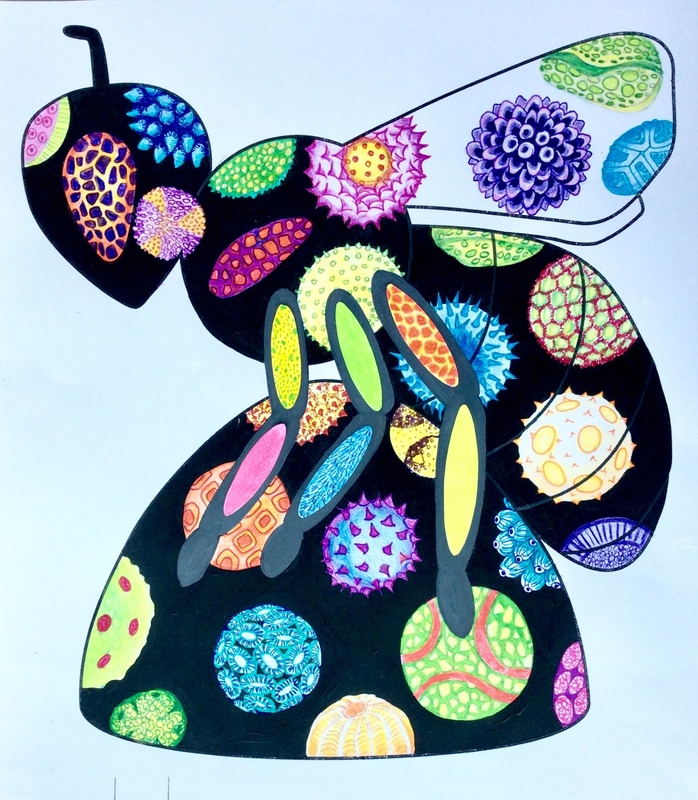 Pam’s design was inspired by magnified pollen images. 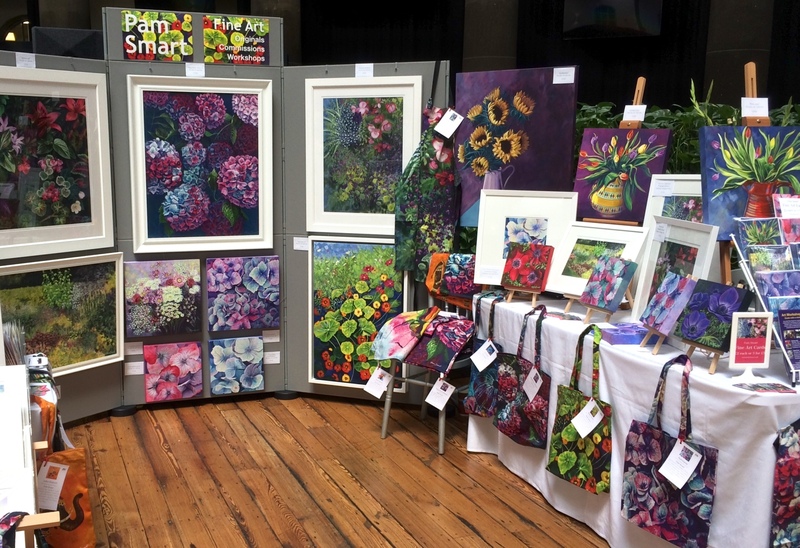 Pam joined the Peak District Artisans for their annual Great Dome Art Fair in Buxton, where she launched her new range of printed merchandise. 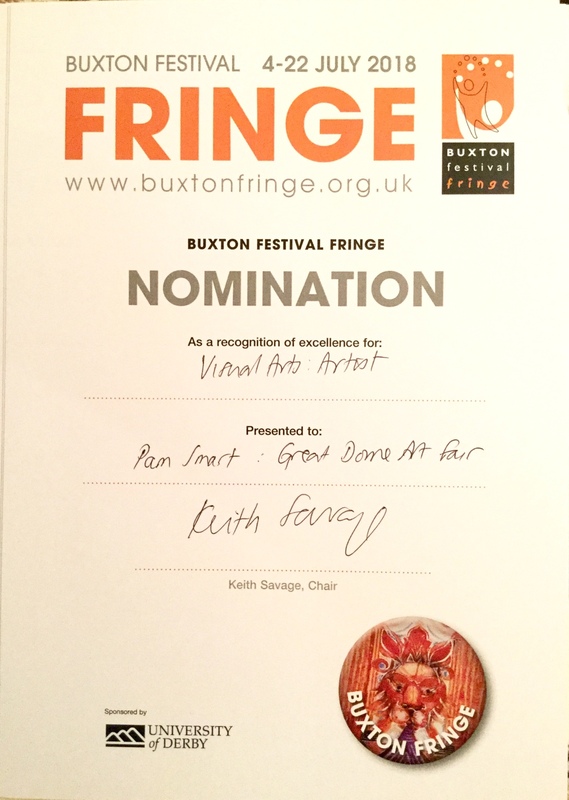 She was nominated by Buxton Fringe for excellence in visual arts. 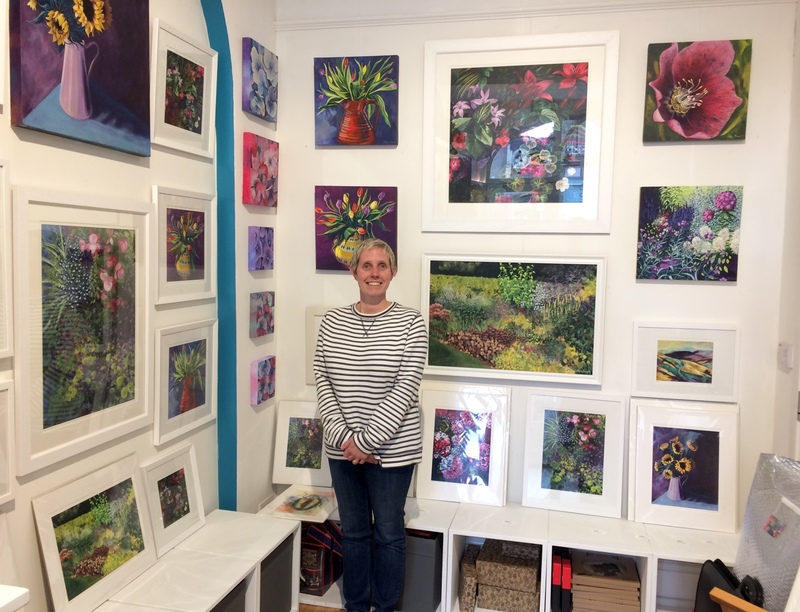 Visitors to Cromford Studio and Gallery were treated to a colourful show of Pam’s vibrant paintings of flowers, insects, natural forms and architecture. Pam was invited to exhibit her work in the ‘Inspired by the Peak District’ marquee alongside other local artisans. 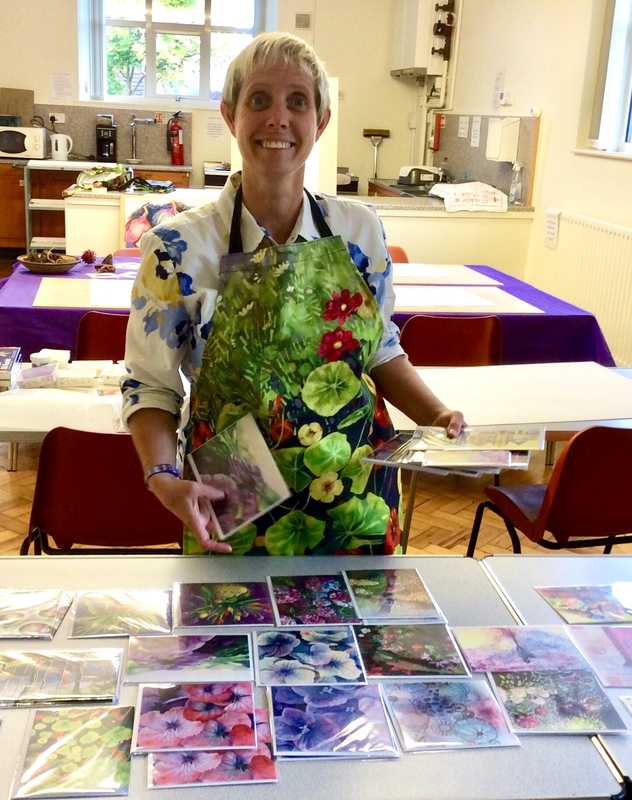 Her stand included textile products printed with bold Florals and natural forms, original paintings and her range of beautiful fine art cards. 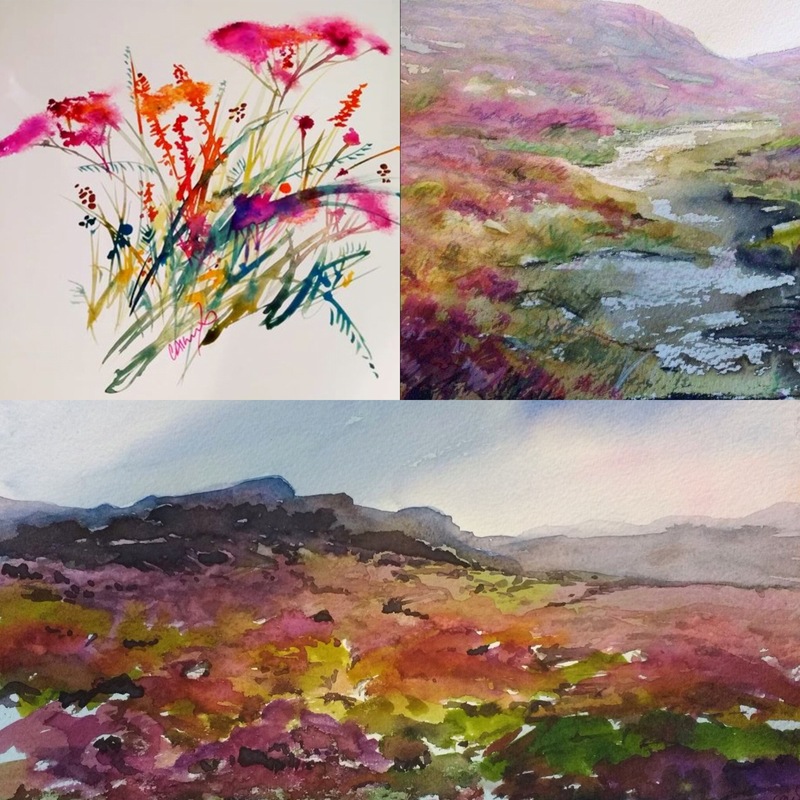 In September Pam was invited by Purple and Grey to be guest artist at their Matlock art group. The theme was giant Fruit and Natural Forms. 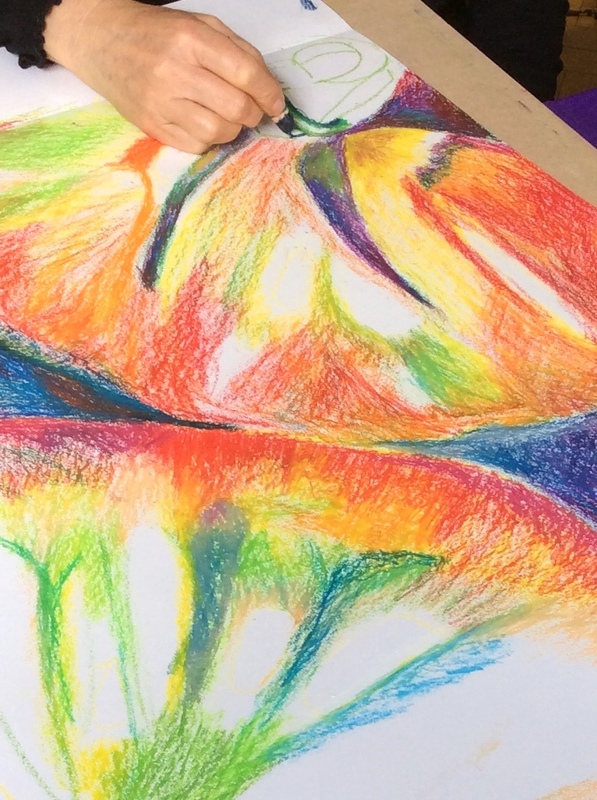 Using oil pastels they explored colour contrasts and Mark making on a giant scale! 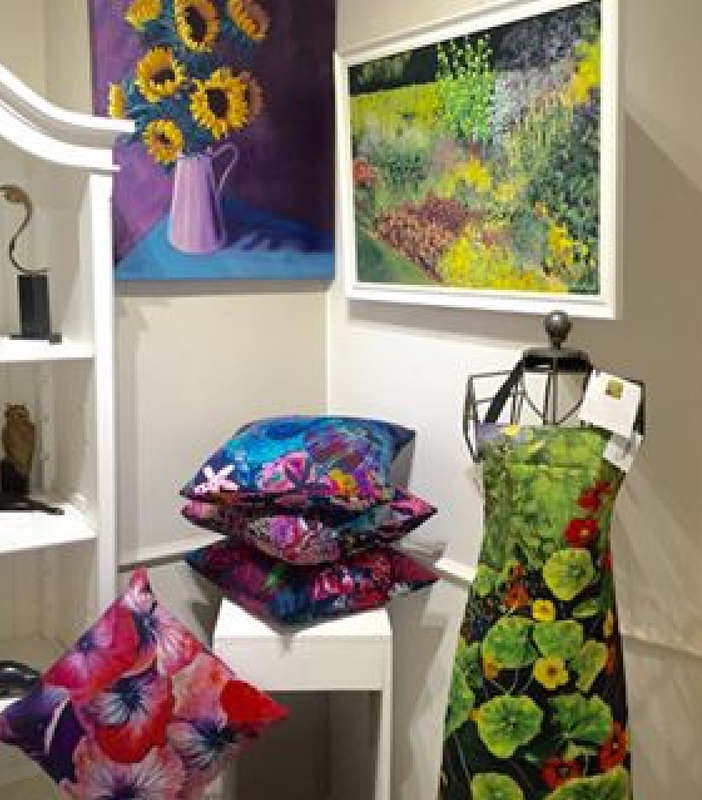 A beautiful display of Pam’s original paintings including the popular ‘Sunflowers’ painting featured in Jarva Gallery alongside her prints, cards, cushions and aprons. 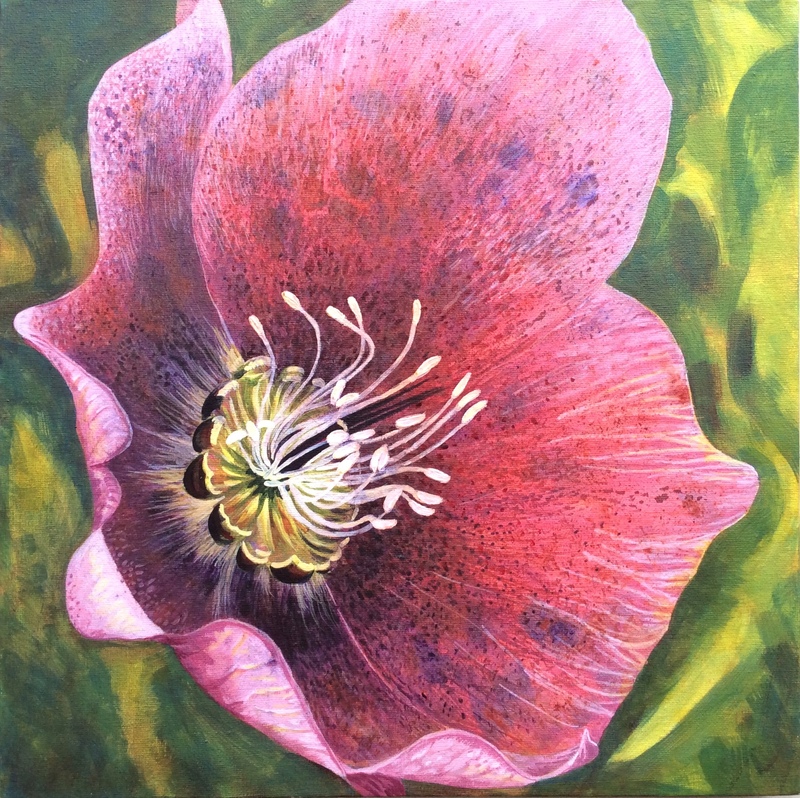 Pam was delighted to have her painting selected for The Derbyshire Open Competition. 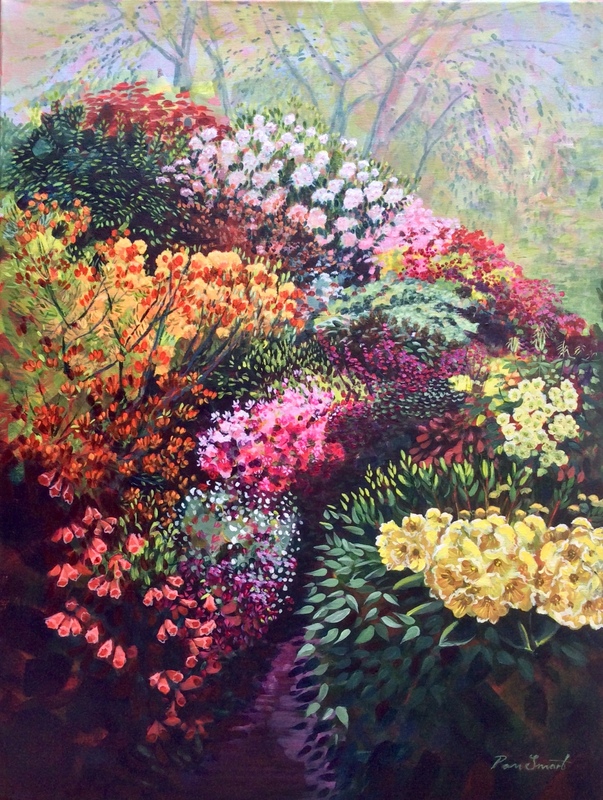 The painting ‘A Riot of Colour at Lea Gardens was on display in the Buxton Museum and Gallery over the summer. Her entry for the Buxton Spa Prize was displayed at The Green Man Gallery. Pam’s colourful design for the Fringe Festival brochure Competition was used on Festival postcards. Her design ‘Buxton Circular’ was based on circular details of the town’s architecture. 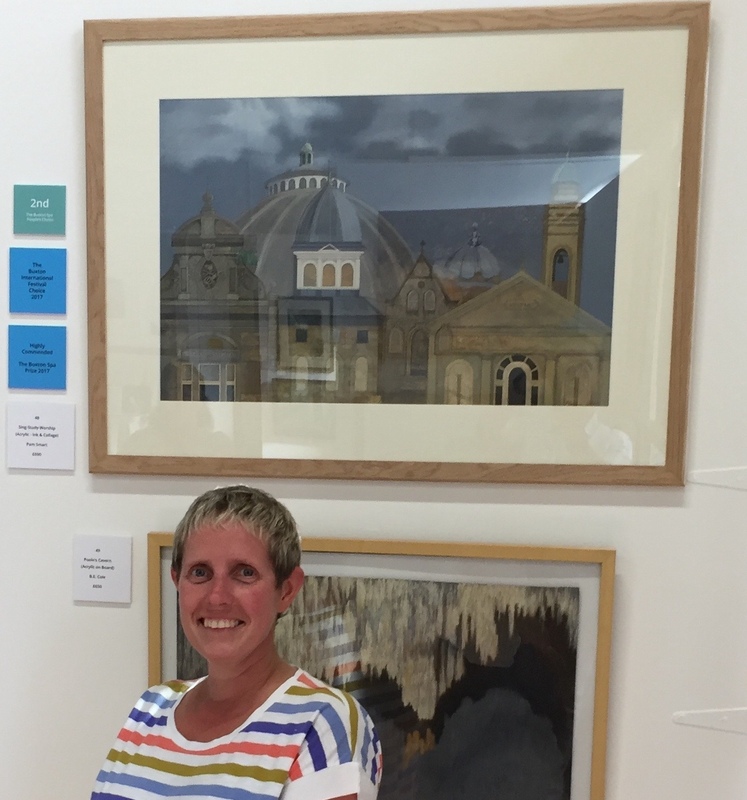 Pam’s award winning painting will have a permanent home in The Dome, Buxton. 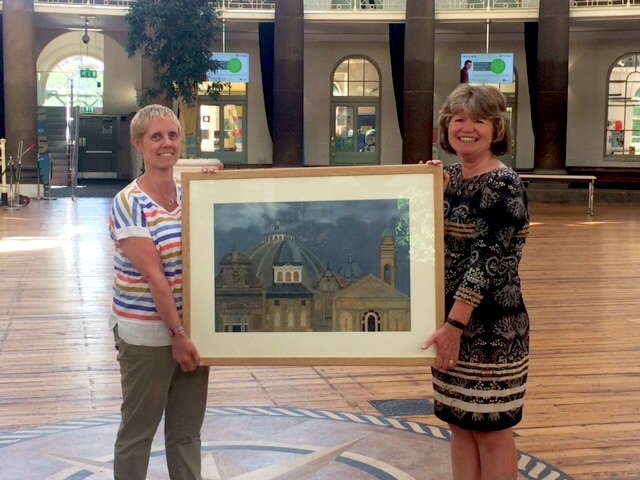 Derby University purchased ‘Sing, Study, Worship’ which features the fantastic architecture of the Dome and was Pam’s entry to the Buxton Spa Prize in 2017. She was awarded the Buxton International Festival Award which meant that her winning design was featured in this years International Festival brochure. 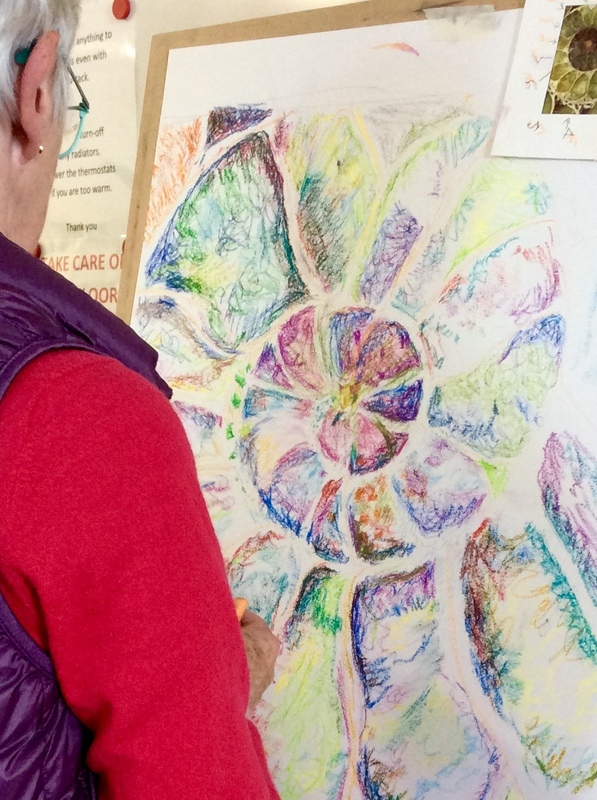 Over the May bank holiday weekend Pam opened up her studio to the public. 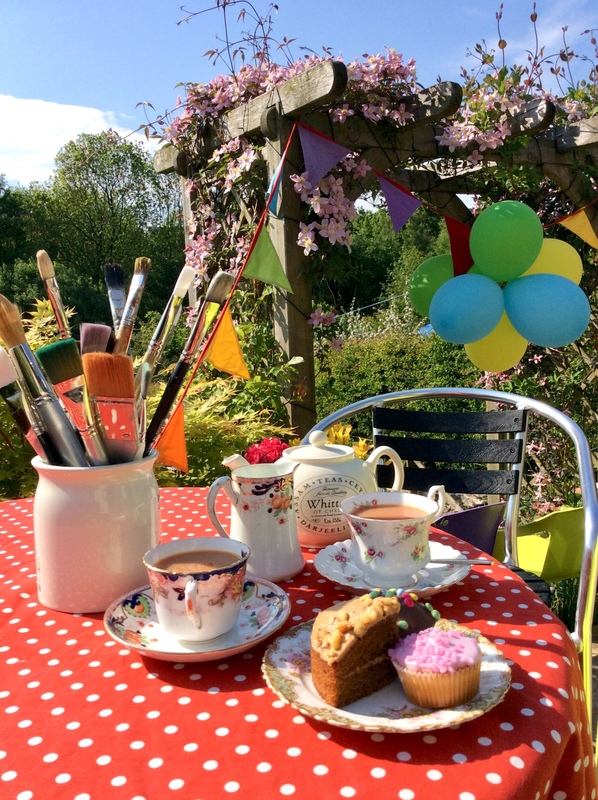 Visitors could enjoy the view with tea and cake whilst perusing the display of Pam’s artwork. Pam was also joined by jewellery designer Yuka Jourdain. 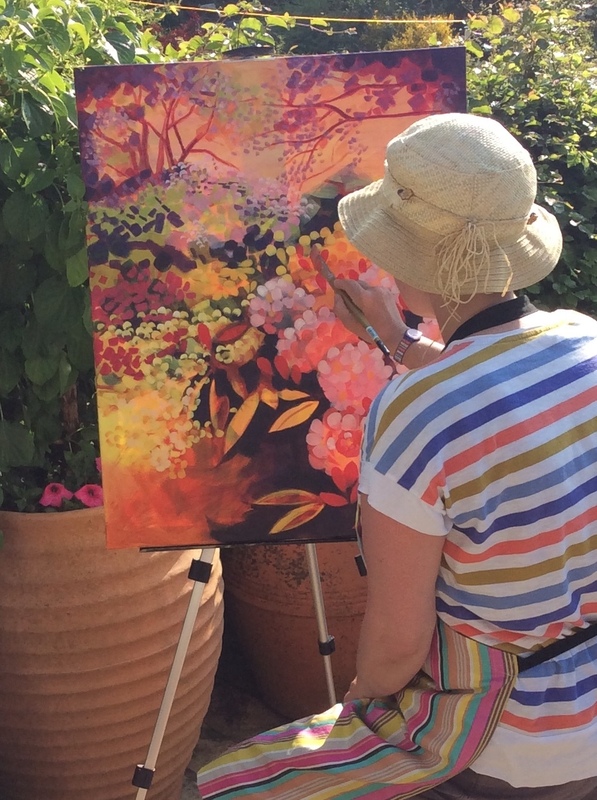 What a beautiful sunny weekend it was -even time for a little painting ‘En Plein Air’. 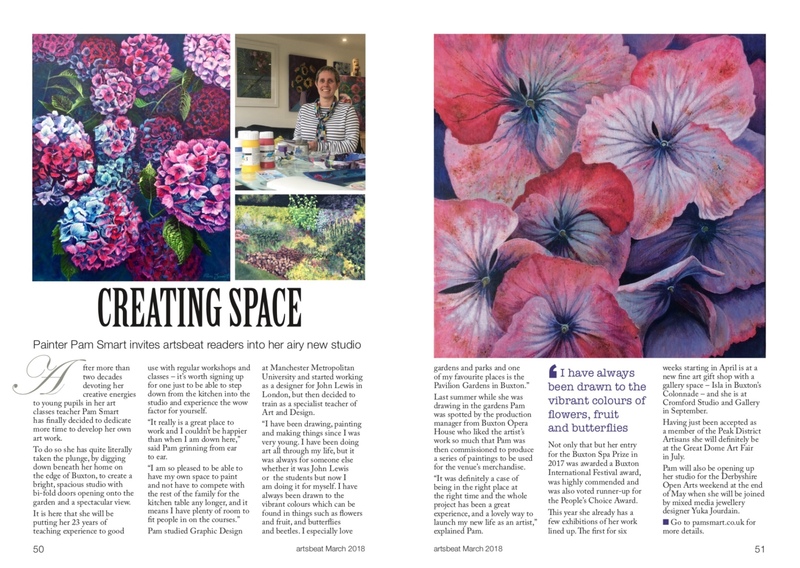 You could read all about Pam’s light and spacious studio and wide programme of Art workshops in the March edition of Artsbeat magazine. Pam tells Artsbeat how the studio space was created by digging down behind their Edwardian House! The delightful Isla Fine Arts and Gifts was host to a display of work by Pam Smart. 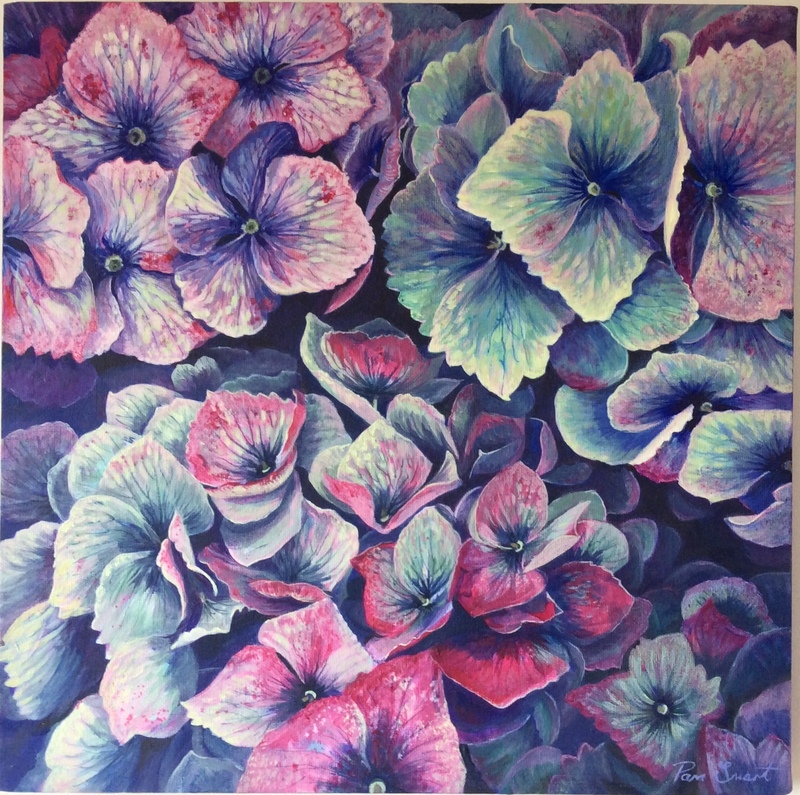 A solo exhibition featuring a collection of her contemporary Florals. 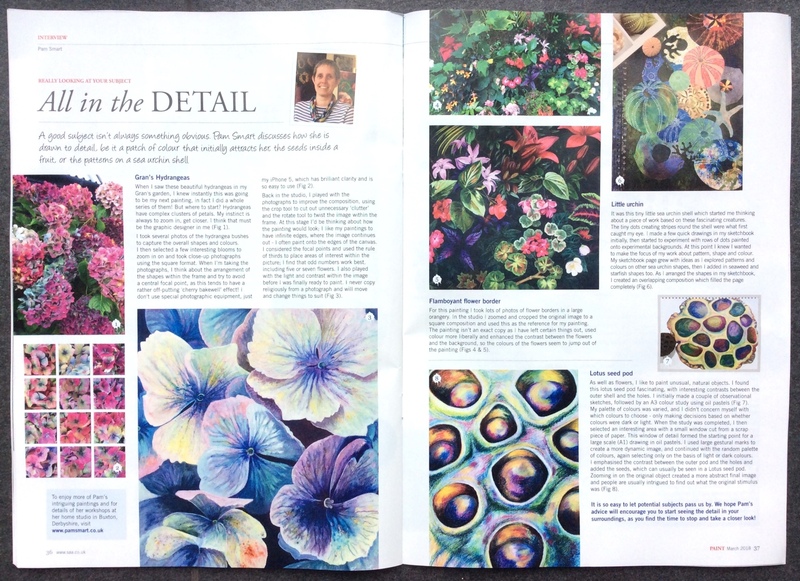 The SAA art magazine published Pam’s article about taking a closer look at nature. 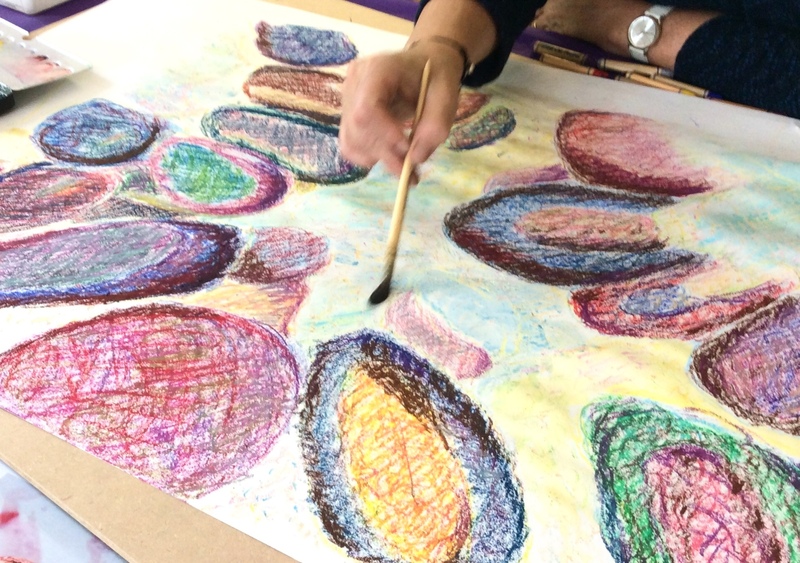 Looking at a seed pod which Pam initially made sketches of, then developed the image by zooming in and enlarging to create an A1 sized colourful drawing. 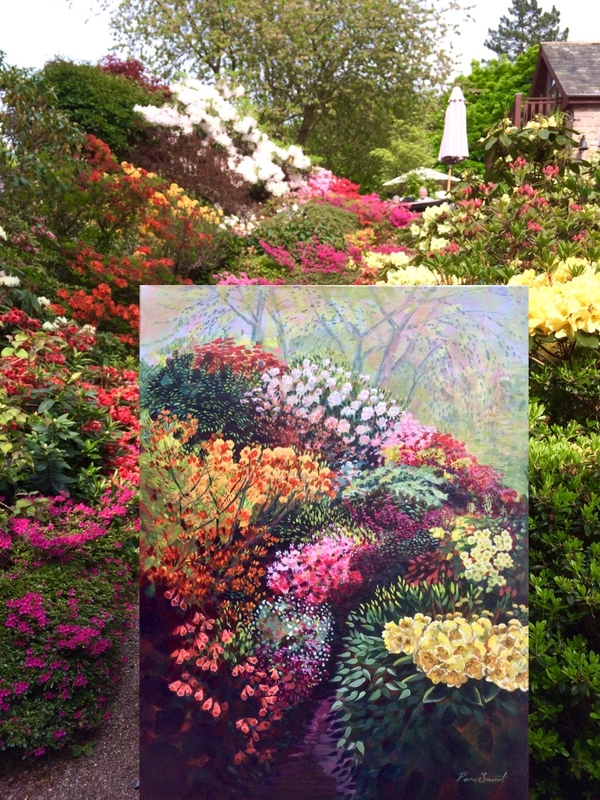 In the article she also describes the process of selecting from hundreds of her Hydrangeas photographs, which she then crops, magnifies and uses to create her detailed and colourful paintings. 3 awards at the Buxton Spa Prize! ‘Sing, Study, Worship’ was the title of Pam’s entry for the 2017 Buxton Spa Prize. Working from the viewpoint of St.Johns church and taking in views of the Dome and the studio theatre Pam develop an overlapping image of Buxton’s skyline using acrylics and vintage maps. She was delighted to be awarded an ‘International Festival Award’ a Highly Commended and cake runner up in the People’s Choice Award.